Medical tourism has become a catchphrase in the early years of the 21st Century for even the most unlikely of destinations. This chapter outlines the issues and practices involved in an assessment of the status of medical tourism in the emerging economies and destinations of the Asian Region. A selection of countries as case studies covers the region from the Central Asian Republics of Kazakhstan and Uzbekistan, South Asia (Sri Lanka), through to Cambodia, Taiwan, Myanmar, and Japan. The growth of medical tourism in the Asian region, and its various economic and social impact on abovementioned countries is under focus in this chapter. It provides a comprehensive view of how different countries should capitalize on their advantage to increase their share of regional or international medical tourism market. Both technological advances and traditional medicine have provided comparative advantage for medical tourism destinations in the Asian region. Medical tourism has become a catchphrase in the early years of the 21st Century for even the most unlikely of destinations (Carrera & Bridges, 2006; Bookman & Bookman, 2007; Xian, 2010; Connell, 2013; Hall, 2013). This is perhaps not surprising given the width and depth of the definitions of this form of tourism, but this did impact on the choice of countries and case studies to include in Section 3 of the book. 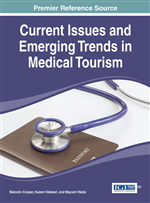 This Chapter outlines the issues and practices involved in an assessment of the status of medical tourism in the emerging economies and destinations of the Asian Region. A selection of countries as case studies covers the region from the Central Asian Republics of Kazakhstan and Uzbekistan, South Asia (Sri Lanka), through to Cambodia, Taiwan, Myanmar, and Japan. It also makes comment on Thailand, a developed medical tourism destination in this Region. With the imminent creation of the ASEAN Economic Community (AEC), and the further integration of the North and South Asian economic groupings, a higher level of medical tourism is predicted in the Asian Region. For example, more Cambodians may use Thailand’s hospitals services once the ASEAN Economic Community begins in late 2015 (Travel Weekly, 2013). These patients will enter at overland checkpoints and use the facilities of the more sophisticated provincial hospitals, or go to Bangkok for treatment. In its 26 August 2013 report, the Travel Weekly travel magazine noted that there were over 2 million medical tourists in 2012-2013 that sought treatment in Thailand. The report suggested that, even so, the advent of the AEC will bring further business opportunities for private hospitals in the Thai provinces bordering Laos, Myanmar and Cambodia. There are currently over 150 hospitals in Thailand that have met the governance and facility/staff requirements that would allow them to serve the medical tourism market likely to be generated by the AEC. However, many of these are often already overcrowded with local cases, and are in any event not geared to treating inbound tourists other than in emergencies. Language is another major problem for hospitals when dealing with medical tourists. Intra-regional competitors Singapore and Malaysia, using their command of English, are promoting their medical services in countries like Cambodia, in competition with Thailand’s top hospitals. As a result, Malaysia is becoming a popular tourism destination for Cambodians and others (Chee, 2010). Promotion of Malaysian medical services in Cambodia, Myanmar and Laos is organized directly from Kuala Lumpur. At present some 50,000 Cambodians visit Malaysia each year, and the reasons for this trip for many of them include medical check-ups. There are alternative destinations for Cambodians, including the USA; but Malaysian hospital fees are 25% below the United States, Thailand is slightly lower at 30% on the same scale, Singapore is at 35% of the USA, and India at 20% (Medical Tourism Magazine, 2014).